Tucked into a suburb of St. Louis, First Rule Film & Broadcast has built a network-caliber studio that plays host to many types of broadcasts. Located on the 16th and 17th floor of a high rise, First Rule has set a high standard. With sweeping views of downtown St. Louis, the company’s office commands a certain presence, a presence they also wanted in their studio design. First Rule Film & Broadcast is the brainchild of Travis Brown, who owns parent company Pelopidas, an issues-based advocacy and lobbying firm that works with many campaigns across the state of Missouri. Brown makes many appearances on national networks, such as Fox News, and he and his partner envision the space as a multi-purpose studio for hire. Peter Provost and Paul Benson of Provost Studio and Peter Hyde of Peter Hyde Design collaborated with First Rule to create two separate spaces, a 30′ x 30′ broadcast studio and a broadcast ready event space that could be used for town halls, parties and shows involving a studio audience. The studio came online in fall 2014, with Sinclair’s KDNL-TV signing on as the first major renter. Like many things at KDNL-TV, the setup is a bit different than that of a traditional station. 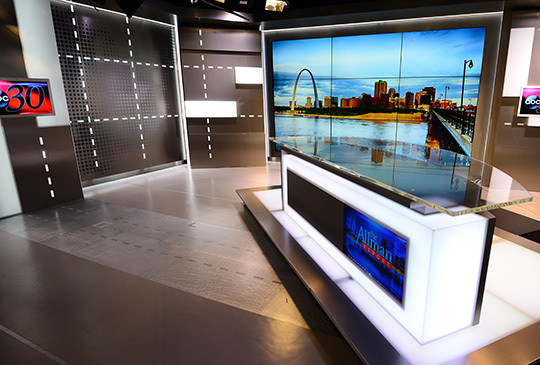 The St. Louis ABC affiliate last produced its own newscast in 2001. 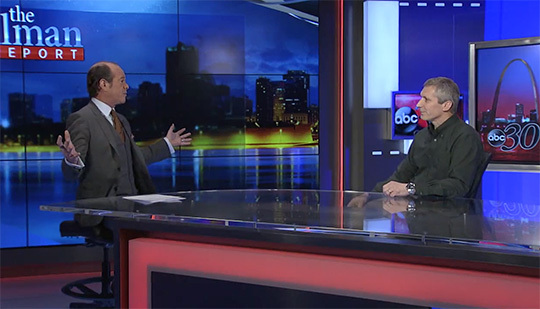 For many years, the station was the largest market ABC affiliate with no news, but in 2013 Gannett’s KSDK-TV began producing a 30 minute program on behalf of KDNL-TV. 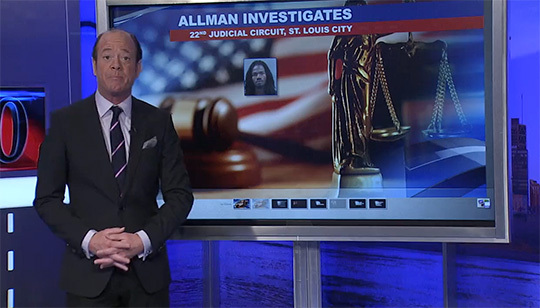 With the move to First Rule, KDNL-TV and Sinclair were once again trying to reimagine the mold of a TV news program and “The Allman Report” was created, fronted by former conservative talk radio host Jamie Allman. 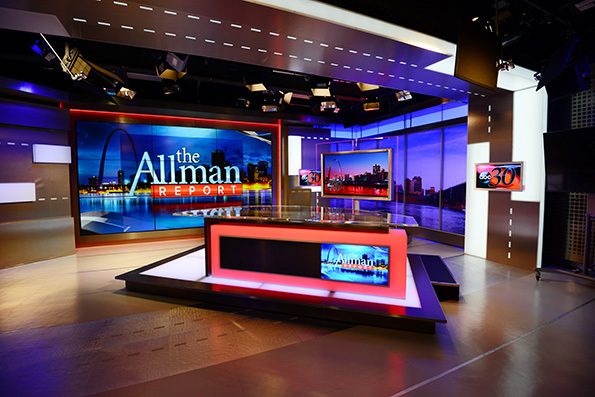 “The Allman Report” has been on-air since January, and the studio continues to see other uses for network live shots and new shows, including one set to launch in the coming weeks. 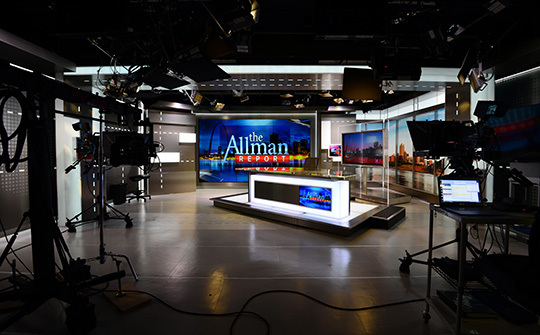 “All of the major cable networks have used the space for live shots,” said Glessner. With such a small foot print, flexibility is a key concept built into the design by Provost. 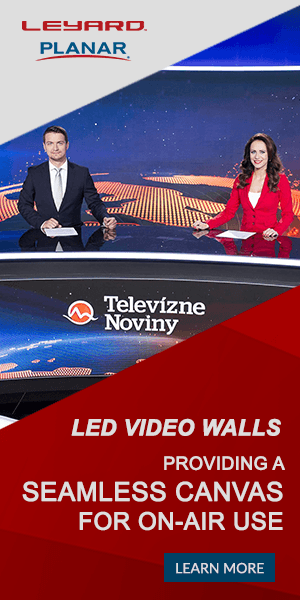 The set uses LED color-changing panels to allow multiple programmable looks, along with sliding panels and moveable elements, including the anchor desk. The set also includes a 3 x 3 monitor wall and a large, rolling touchscreen. One unique feature of the design is the portal, a backlit element that spans the width of the studio, creating a unique header element that divides the studio. “The features that Peter and Peter designed could have only come from an experienced designer,” said Glessner.